I need to know what type of Paint is safe for my tortoise table? I have a 5 year old Sulcata Tortoise. For the last 4 years she has been living in a glass Aquarium. Somebody told me it wasn't safe to keep a tortoise in an Aquarium. Not only that she is quickly outgrowing it. So I Built a Tortoise table yesterday. I built it out of Plywood and it looks great. Now my only problem is I heard I need to seal/paint the wood. I cannot find what type of paint I use.. I don't want to in anyway Harm my tortoise. I've read I could use A Non-Toxic Latex paint, but I would have to wait 28 day to let it air out. My tortoise needs to be put in a new enclosure ASAP. I read on another site I could use a water based polyurethane, and wait at least a week before placing my tortoise in it. I can wait a week, but not sure if that's the type of paint I'm supposed to use. If anybody could PLEASE help me out. Like I said This is the third site in which I've asked this question. So any help would be greatly be appreciated. 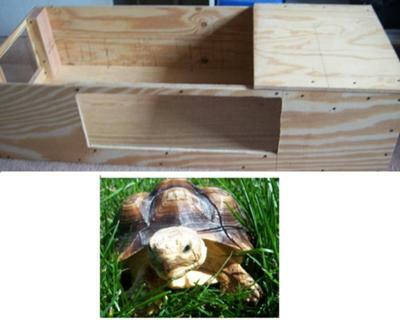 I've included a picture of My tortoise table I built and A picture of my tortoise. Thanks again to anybody that can help me!!! Comments for I need to know what type of Paint is safe for my tortoise table? I'm not sure about the best tortoise table paint, but I found some other Web pages that might help you. My human thinks you could also ask your local paint store.